In this example we add functionality to connect to the web using a GPRS connection. 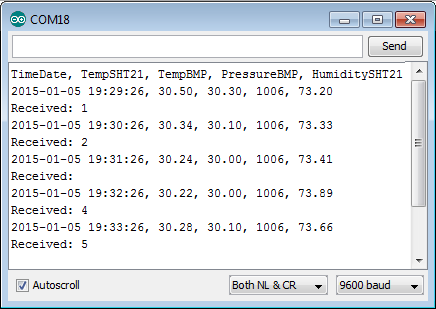 Here we will be demonstrating how to send the sensor readings via a HTTP command to a website. 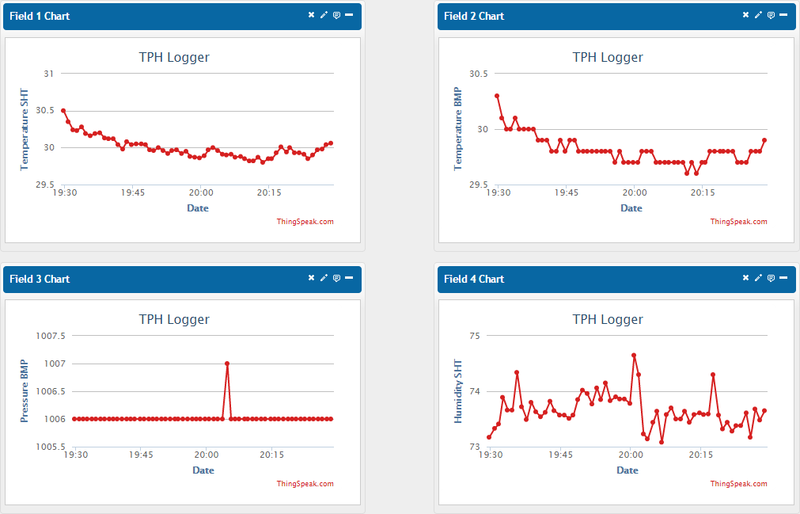 Specifically, we use the ThingSpeak website which provides a simple and free API for logging data from a variety of devices and sensors. Copy the WRITE API KEY for your new channel (see the API KEYS tab). 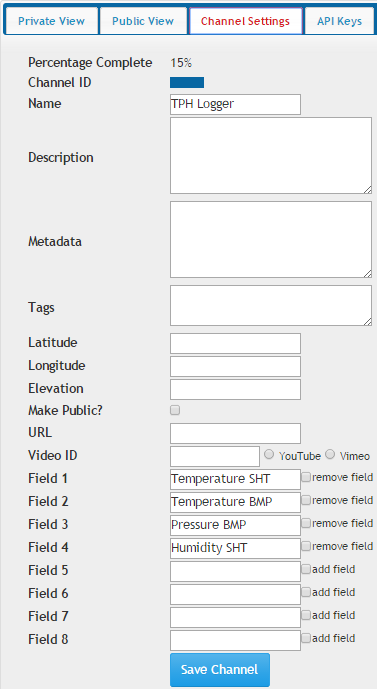 You must to add four fields to your channel. Note: The channel and field names are used for labeling the data in the charts shown on the private and public view tabs (see the image above). The names have no affect on the API and can be changed at any time. 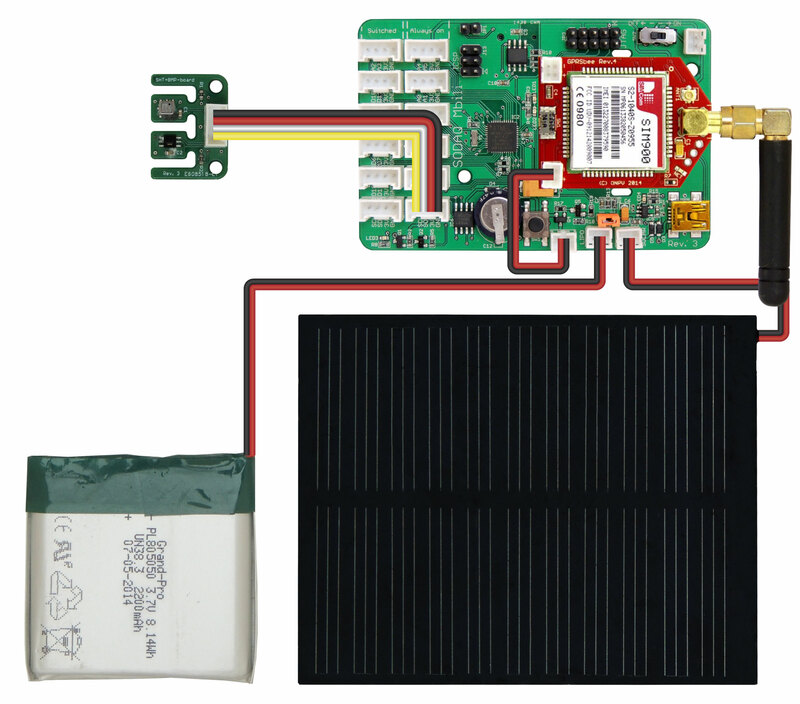 The GPRSbee library is included with the SODAQ Mbili files that you have already installed. You should refer to the board diagram, the Grove sockets page, and the GPRSbee Connection for additional information..
Then, install the GPRSbee Module into the Bee socket. Next, using the wiring diagram for the Switched Power Method, plug the 1A LiPo battery and GPRSbee power connectors into their sockets. Finally, plug the 0.5W solar panel into its socket. In addition to the existing libraries, we must now also include the GPRSbee library in the sketch using the #include compiler directive. The ThingSpeak API limits data submission to a maximum of once every 15 seconds. Additionally, it takes some time to establish the GPRS connection before any data can be sent. For this reason, we adjust the READ_DELAY constant so that the readings are taken once per minute (the units are milliseconds). We then define a series of constants which are used for setting up the GPRS connection and for sending the data to ThingSpeak. The constants APN, APN_USERNAME,and APN_PASSWORD need to be set to the correct values for your particular network. Additionally, WRITE_API_KEY needs to be set to the Write API Key value shown on the API KEYS tab of your ThingSpeak channel’s page. The other constants are used for formatting the data sent with the URL. Note: The constants LABELX define the data labels for each of the fields. For the ThingSpeak API you must use the labels fieldN. However, if you are modifying this example to work with another site you can change the labels here to suit your needs. Additional note: You can also submit the data to “184.106.153.149/update”, this can be useful if your network is unable to resolve the specified URL. You should try this if you are receiving 603 DNS Error responses (+HTTPACTION:0,603,0). You can see what the responses you are getting by enabling debugging (see the setupComms() section) and looking at the output in the Serial Monitor. In addition to the existing setup code, we make a call to the user defined method setupComms() which handles the initialization of the GPRSbee Module. In addition to the existing code for taking the sensor readings, we also make a call to the user defined method createDataURL(). This method returns a String containing the target URL as well as the sensor data in a format that can be sent directly with a HTTP request. We then send the URL String over the GPRS connection with a call to the user defined methodsendURLData(). Here we initialize the GPRSbee Module. The Bee socket on the SODAQ Mbili is connected to the second serial port which is accessed through the Serial1 object. We start with initializing Serial1 with a call to Serial.begin(). We then initialize the GPRSbee Module using the methodgprsbee.init(). The three parameters passed to this method include: the Serial object that the GPRSbee Module is connected to, the CTSВ pin (BEECTS), and the power pin (BEEDTR). Note: If you need to debug the GPRSbee Module, you can uncomment the line which calls the method gprsbee.setDiag(). This method connects the output from Serial1 to Serial so that any data sent over the Serial1 connection is also sent over Serial and is displayed in the Serial Monitor. This method is similar in purpose to the existing user defined method createDataRecord(), which creates and returns a String containing the sensor readings in CSV format. However, instead of the CSV format, this method constructs a String which contains the target URL, the WRITE API KEY and the data from the sensor readings; all formatted for submission via a HTTP command to the ThingSpeak website. Here we send the constructed URL String using a HTTP GET command. The reply from the ThingSpeak website is normally the entry number of that submission. If the result is 0 the data was not successfully submitted. You may notice that sometimes nothing is received. This does not necessarily mean that the data was not successfully submitted, it just means that no answer was received before a timeout occurred.